Work, home, and _____. Where was your third place this year? Did you like it, love it, …or was it out of obligation? What feeling, sense, or vibe did you get from your third place? If someone can’t imagine the scene, give the lay of the land in words. Is there natural light? Is there a certain smell? Bring us inside. I went back and forth a lot about this question. On one hand, I have been spending a lot of time at the Speak Easy lately, as well as Foundry Provisions, to get out of the house and get some work done. But I think that those places count as work, so I’m not going to use them. I’m a little ashamed to admit this, but I think my third place is now Broad Ripple Sushi Bar. Why would this be my third place? I think I have a problem…a slight addiction. I may or may not have had it for dinner last night and lunch today. LESS THAN 16 HOURS IN BETWEEN MEALS THERE. What is wrong with me? 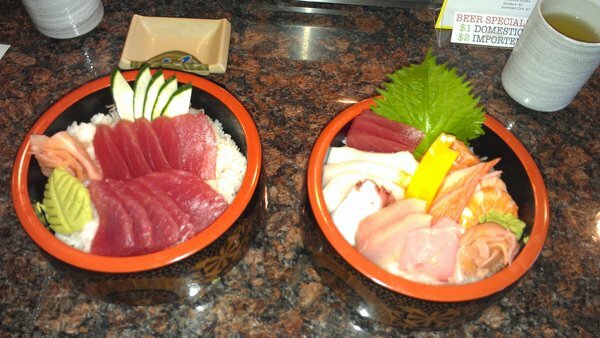 Tuna on the left, Chirashi on the right…I’m drooling just looking at this picture. Their sushi is THAT GOOD. I used to be a Naked Tchopstix customer, mainly for the Plum Blossoms (I’m not a lush, but those suckers are goooood). But once I tried the Chirashi from Sushi Bar, I fell in love. I started ordering it for carry out after work at least once a week. Now, they don’t even ask for my name or phone number anymore, they probably call me the Crazy Chirashi Lady. And when I only get one order (instead of two to feed my boyfriend as well), they ask me why I’m not getting one for Ryan. I’ve never been a “regular” at a restaurant before, unless you count my days in my early 20’s being a regular at Casba. I’ll go ahead and assume that raw fish is a healthier option than Casba shots. If you haven’t had Broad Ripple Sushi Bar, do yourself a favor and RUN, don’t walk to try it. They also have amazing hot green tea, seaweed salad and specialty rolls, plus cheap beer and wine and terrible dance music playing on the stereo. But what more could you want? Now I just need someone to teach me how to use chopsticks. Tags: Broad Ripple, chopsticks, sake, sashimi, sushi, techno, thinkkit. Bookmark the permalink.